I didn’t finish watching Powerpuff Girls for a long while. In part, it was because it’s a shame to see the end of a classic show, but mostly it was because by season 6, it wasn’t really feeling like a classic any more. The show had been on air for over 6 years by the time it finished, and felt like it was running short on ideas. Weird and politically incorrect Rocky and Bullwinkle parodies, returning a monster baby to its mama and poor Buttercup being told she’s got no particularly special talent over the other girls don’t feel like the playful and inventive episodes of old. The season plays out without the sparkle of inventiveness or irreverence that characterised its early run. 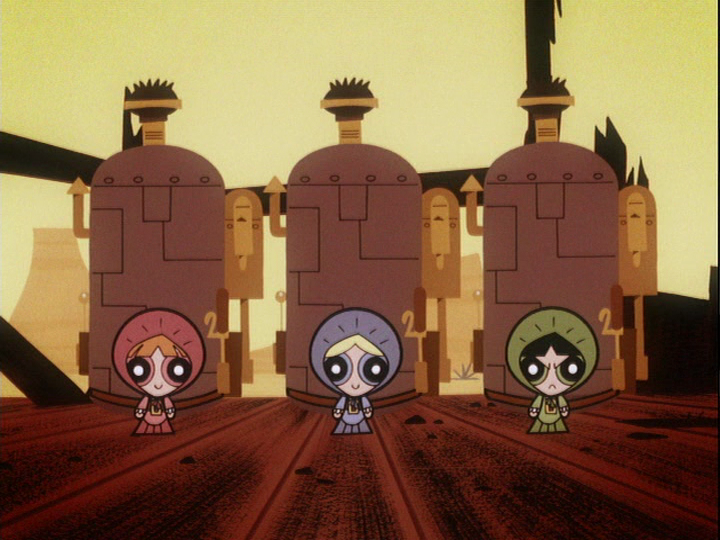 A steampunk episode, featuring the Steamypuff Kids, is pretty fun, though. The Powerpuff Girls have endured in a way that not many similar shows have. There was the anime spinoff, the spiritually similar early My Little Pony: Friendship is Magic and now a new revival that I haven’t seen yet. The designs are enduringly popular and rewatching old episodes never fails to put a smile on my face. But the problem is that there’s only so far you can go. Sure, you can give the little kindergarten-age heroes crushes on some boys and have them go from fist-fighting with their antagonists to going camping with them, but they’re still funny little bug-eyed kids with insane super powers. There’s nothing to discover about their pasts and no angsty teenage plot arcs they can go through. So flipping to alternate worlds of the wild west or making a whole episode in the style of the Who’s concept albums starts to feel a little like scraping the barrel. But apparently there are enough stories to tell for a new series to come out. So I guess my Powerpuff adventure doesn’t stop here.